On Saturday we took our '67 coupe (300hp/327) for a nice drive, stopping at a restaurant for dinner. After dinner we got into the car and I turned the key to engage the starter. The starter turned over the engine normally at first, but then it seemed to sputter, followed by 'KLONK' type noise. I turned the key off immediately upon hearing the noise. Then I noticed a burning smell, followed by smoke coming from the vents at the back of the hood near the windshield. I grabbed my fire extinguisher, popped the hood, and jumped out of the car, expecting the worst - an engine fire. But I could see nothing aflame, just smoke. This cleared fairly quickly and I could see nothing from above to indicate the source. I knelt down to look underneath, but could see no apparent source of the combustion. Once the smoke had cleared, I started the car, which sprung to life normally. Puzzled, I drove home, wondering what had caused the earlier klonking noise and subsequent smoke. Yesterday, I drove the car again. It started normally, no strange noises, or smoke. I drove it to a couple of places, turned the engine off, and it restarted without issue. So, since the smoke event on Saturday, I've started the car at least five times without incident. My current theory is that the smoke may have come from the starter. Is this a reasonable supposition? If not the starter, then what else could cause a klonking noise then smoke? We're planniing to take this car on an 800 mile road trip in May. As the car is an automatic I'm thinking it might be worthwhile replacing the starter now, instead of it blowing up and stranding me far from home. Actually....I'm Speechless!!! That is really unusual....I mean that I'm speechless! Might not be the starter at all. IMO, if that KLONK and smoke was from the starter I think it would have been "Cooked"......Any chance it was Carb "Backfire"? Then I noticed a burning smell, followed by smoke coming from the vents at the back of the hood near the windshield. The vents at the back of the hood do not vent the engine compartment. If the smoke did come out of those vents, the smoke had to come out from under the dash. You likely have some melted insulation somewhere. Start looking. [QUOTE=MikeM;1599107781]The vents at the back of the hood do not vent the engine compartment. If the smoke did come out of those vents, the smoke had to come out from under the dash. It’s hard to put the smoke back in once it escapes! You may be able to see the roasted wiring if it is under the dash. If you can get your head and body into position with a strong light, fried wiring is pretty easy to see. However, does everything else work normally? Is your clock still running, does the radio (if you have one) still work, and other changes that could be related to the up in smoke situation? 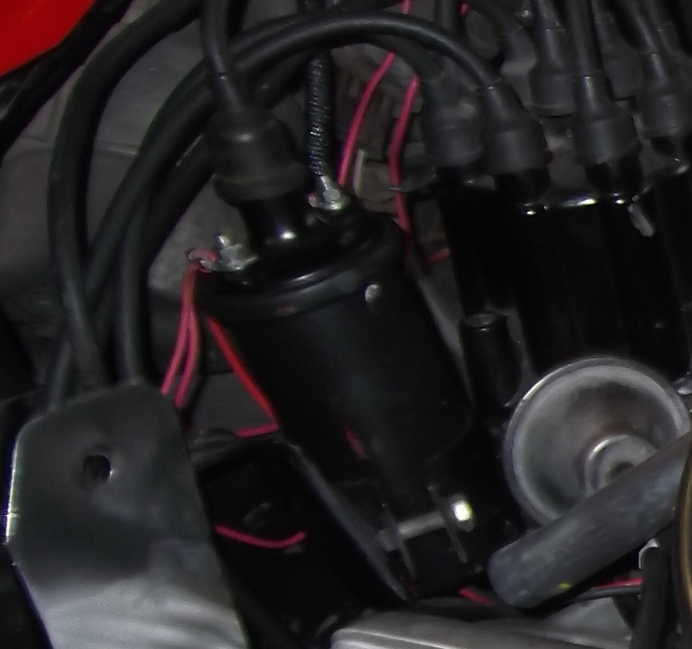 Second, check that there is no way the shield could contact ignition coil terminals...the coil should always be positioned as shown to preclude that happening (note the pink wires in the picture). Last edited by Frankie the Fink; 03-25-2019 at 05:50 PM. Good time to see a reputable car mechanic before you have an engine fire. Does the 66 300 HP use a ballast on the firewall or a resistor wire? They can be made to smoke up pretty good and still work, but maybe not for long. Still doesn't explain the "klonk" noise that he heard. The clunk could easily be the bendix gear engaging the flywheel. The OP states he has a 67 which is suppose to have fusible links - correct? I have witnessed fusible links smoldering and smoking even to the point of discoloring and deforming (melting) the jacket (covering) on the wire and still work. I had a friend with a Chevelle that had a shorted connection on the solenoid. He fooled with it for 3 months and couldn't get the problem fixed. When he hooked up the battery, the fusible link would smoke. I found and fixed the short at the solenoid and the car has been running fine with the deformed, discolored fusible link. The confusing part is the self healing short that created the hot wire and smoke. I would carefully inspect all of the wires passing near the exhaust manifold or header. If a wire came in contact and shorted and then during an attempting to find the problem, the wire was broken free, it would temporarily remove the short until the wire is once again moved against the manifold. Chevy originally had a harness (loom) on the wire bundle going to the starter, but that protection seems to have been a common delete when changing the starter. I don't understand from the post how much smoke was it? a cigarette level or a campfire? ie, one wire or a bunch of them? Do not go on any extended trips as the starter runs on smoke. When it runs out, the car will not start. Last edited by Roger Walling; 03-26-2019 at 09:55 AM. OMG! Buy a new starter and end this ridiculous debate. You might be as well served flushing a $100 bill down the commode. Last edited by MikeM; 03-26-2019 at 11:20 AM. I agree. Thank you for the morning snicker, Mike. I've seen that smoke before and agree with Frankie. Look at the pink wire from one end to the other. Quick Reply: Smoke from starter?